ACT Alliance General Secretary Rudelmar Bueno de Faria has begun his tenure with ACT by focusing on enhancing ACT’s relationships with the United Nations and other global agencies. In his first weeks he has held meetings with UNICEF, UNFPA, UN Women, UNDP, the UN Deputy-Secretary-General´s office, the UN Secretary-General’s Special Adviser on the Prevention of Genocide, and the World Bank. Another factor that is helping to begin conversations is the ongoing dialogue throughout the sector on faith and development, and the role of religious leaders in issues ranging from disaster risk reduction to gender equality. “Gender needs to be at the centre of all our work—humanitarian, development and advocacy. 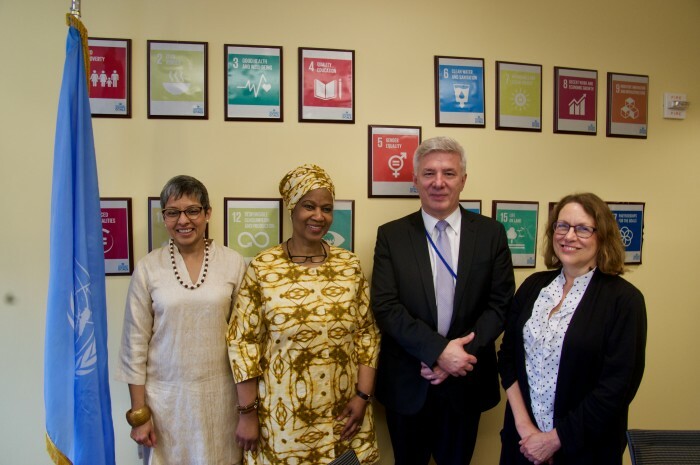 Without significant changes in gender equality in all levels, we will not make any change,” Rudelmar said during a meeting with Phumzile Mlambo-Ngcuka, Executive Director of UN Women. A goal of these meetings is to begin to link UN agencies with ACT forums- to begin relationships that will lead to collaboration, building synergy between both groups and enhancing our ability to advance key development, humanitarian and advocacy topics by bringing local people together to talk and learn at the national level, and by feeding in to international discussions. Adama Dieng, Special Adviser to the Secretary General on the Prevention of Genocide, has put forward a Plan of Action for religious leaders to prevent incitement that could lead to atrocities. The UN recognizes the power of religion both to incite, but also to help diffuse, situations around the world. ACT, with its 145 faith-based members around the world, can enable practical engagement with communities and also with faith leaders in over 100 countries around the world. Dr. Azza Karam, the Chair of the UN Task Force on Religion and Development, noted that ACT is well positioned as a potential partner with the UN because of its strong focus on gender rights and its engagement at the national level. At meetings with with Dr Natalia Kanem (Acting Executive Director of UNFPA,) Anthony Lake (Executive Director of UNICEF,) Magdy Martinez-Soliman (UN Assistant Secretary-General and Assistant Executive Director of UNDP) and Sheila Redzepi (Vice-President for External and Corporate Relations at the World Bank), these agencies confirmed the importance of organizations like ACT to establish partnerships to advance sustainable development, human rights and humanitarian action. Work is underway with five of the UN agencies to build partnership agreements and memoranda of understanding with ACT. Rudelmar will keep building relationships with these and other international agencies, opening doors for ACT members to continue the conversation and the work, to be cohesive, relevant and effective in our work as an alliance.